A lot of the frames we repair & respray are bikes which customers have had a long time and would like to give them a new lease of life. 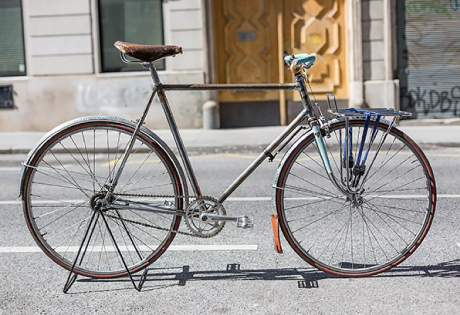 Such is the beauty of a classic steel frame, that same frame can undergo several different facelifts and alterations, or even be taken back to original spec. All this is thanks to the inherent properties of steel frames which make them unique in our otherwise throwaway society. This particular frame suffered from the common issue of having been made to fit a modern wheel, by pulling the stays apart. Unfortunately this always lead to the frame ending up wildly out of alignment, because the stays always open more towards one side than the other. A bit hard to tell from the photo but the right hand seat stay was badly bowed and the alignment of the dropouts was way out. The only remedy is to remove the brake bridge, straighten the stays, re-track and then fit a wider brake bridge to suit the new spacing.